So, What is a Root Word? A root word is the most basic form of a word that is able to convey a particular description, thought or meaning. If that definition is good enough for you, you should skip to the useful stuff. Below, as it always seems to be whenever we discuss linguistics, things get decidedly more technical. In linguistics, [okay, last warning] English language roots are officially known as "morphemes" and defined as the primary lexical unit of a word. They carry significant aspects of semantic content and cannot be reduced into any smaller constituents parts. Almost all regular English words contain, and may consist only of, "root morphemes." Sometimes the term "root" is used to describe the word minus its inflectional endings, but with its lexical endings in place. Inflection is the change or marking of a word to reflect grammar, such as gender, tense, number or person. A word independent of different inflections is called a lexeme, while the form of a word that is considered to have no or minimal inflection is called a lemma. For example, the word "maddening" has the inflectional root or lemma "madden," but the lexical root "mad." Inflectional roots are often referred to as stems, and a root in the stricter sense may be thought of as a monomorphemic stem, or a stem with only one morpheme. 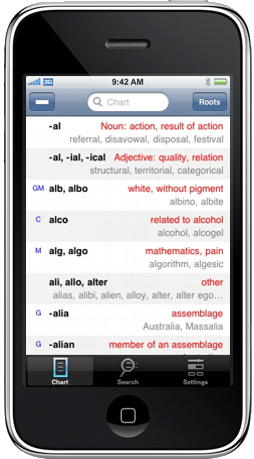 Roots can be either "free morphemes" or "bound morphemes." Root morphemes are essential for adding prefixes and suffixes and for constructing compound words. Free morphemes, or unbound morphemes, can stand alone, such as the morpheme "near" in the word "nearly." Bound morphemes, on the other hand, occur only as parts of words, such as the morpheme "-ly" in the word "nearly." However, more complicated inflection, as well as other linguistic processes, can make the root obscure. For example, the root of "mice" is "mouse" (a valid but different word), and the root of "interrupt" is "rupt," which is not an actual word in English and only appears in derived forms (e.g. rupture, corrupt). Knowing about these cases will aid the avid vocabulary builder. The living English language has been fed voraciously from more sources than you may care to know about. Certainly, Greek and Latin roots predominate, but the influence of other languages over the past millennium cannot be ignored, for example "kindergarten" which is an unmodified German word. Because of the variety of etymological contributions, ambiguity among English roots exist. Is it the Latin "bi" meaning "two" or the Greek "bi" meaning "life" that is the root for "bisect?" (It is the Latin "two.") Be alert to conflicts like this and review roots that are similar to one another carefully. Go on to more about prefixes & suffixes.